What you get here is MUSCLE, pure and simple, powerful and purposeful, seemingly limitless and untiring. Heidi Clare plays like she's defining 'bearing down'. This is athletic fiddling done by an athlete. To find fiddle chords and drone notes like these you'd have to listen to John Carson, Ray Cline, or G.B. Grayson. There comes a time in modern convention when even those with the strength, taste, and talent to muscle through a tune tend to lighten up for the sake of melody, clarity, or finesse. But Heidi just refuses. Once she's in her "groove" (her word) it would take an old-time southwest Ohio bluegrass bar fight to dislodge her. 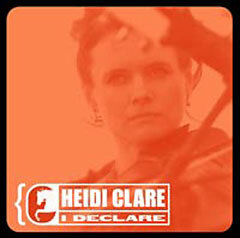 And those are as gone as the fiddlers who defined the standards that Heidi Clare emulates."